This series of guitar lessons for beginners will set you on the right path to becoming a great guitarist, but there is one thing it can't do. It can't practice for you. Practice is the single most important factor in advancing your guitar skills and techniques. It's not hard, it just takes time. You'll see that you'll be advancing with each day, and the things you learn today and tomorrow, will seem soooo easy a couple of months from now. Practice whenever you feel like it, and try to get at least 30 minutes of practice in there per day, or every other day. Sorry, but you've reached a premium content area. 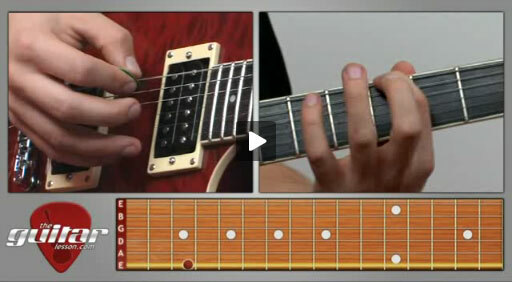 The download of the Guitar Basics – beginner guitar lesson #1 tablature file is only available to premium members. Sorry, the same goes for the backing track. To download the backing track to Guitar Basics – beginner guitar lesson #1, please log in and revisit this page. Thank you Tom for a great lesson, I’ve only been playing for about a week and it’s really nice to be shown a way to increase my speed and accuracy on the fretboard. When do you suggest continuing to the next lesson? Hi there, you can continue fairly quickly from this lesson, you don’t need to have everthing 100% down yet, but you’ll need to practice the things you learned here after moving on as well. It’s a good idea to practice the material from lesson 1 each day before you start practicing to get your finger warmed up as well. Hi Kavi, you can deffinitely strum using just your fingers, but that is a separate technique in itself. I explain it in one of the strumming song videos, I’ll create a separate lesson on it since it’s really useful. But if you’re just starting out, I would really recommend that you get a pick. Do I need a pick to practice on an acoustic guitar or can I strum using my fingers?